The Ford Twin-Traction-Beam (TTB) suspension was a unique, but simple approach to combining the ride & handling qualities of independent suspension with the legendary durability of a straight beam axle. It was built by Ford, in conjunction with Dana using the same technologies used in the Dana-Spicer straight axle. This includes items such as U-jointed axle shafts, fully adjustable/serviceable wheel bearings and standard locking 4WD hubs in both automatic (mechanical) and manually engaged versions. A large number of parts are even interchangeable between the two axle types. The TTB axle is comprised of two beams that are mounted on pivots, with the tire at one end, and the pivot at the other. The pivots from both sides cross over center which adds considerable length to the beam compared to the rather short A-arm setup on conventional independent suspension designs. A U-joint in the center of the axle allows for independent movement of both beams. The TTB suspension is extremely durable in stock form, but wheel travel and articulation traits are somewhat lacking. These things really come to life when modified. With the long suspension beams exceeding 3 feet in length, travel numbers of 18 or more inches (24 or more on full-size versions) is quite easy to obtain with little to no loss in durability. The stock radius arms are a bit on the short side, but can be easily replaced with extended ones similar in length to the axle beam. The Rangers/Bronco II used a Dana28 axle up until the 1st part of 1990, and is not considered very strong. Midway through 1990, they began receiving the Dana35, which is a far stronger axle (from ’93-’97 (some argue ’90-’97, although I have been unable to find any Spicer documents showing before ’93), a “hybrid” version of the D35 using D28 gears was sometimes seen in some non-4.0L trucks. You can check here for ways to identify these) . 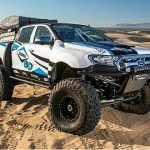 The D35 shares many parts (such as the axle U-joints) with the Dana44 that’s used under the F-150/Bronco and can be swapped in place of the Dana28 quite easily. All these axles have a hi-pinion differential, which improves gear strength and puts the drive shaft up higher out of harm’s way. There’s a wide variety of locking differentials, such as the ARB Air Locker, Detroit Locker and many others available to fit the Dana35 and Dana44 models. These used Dana44 (F-250) and Dana50 (F-250HD/F350) differentials. These are not as easy to work with as the coil versions. To get any decent flex from the leaf TTB would require converting to coil springs and adding radius arms to it. Trying to get any travel using the leafs will only result in binding up of the spring, as the spring wants to travel straight up & down, but the axle is trying to swing in an arc. Kind of a weird setup. Leafs were better left on straight axles. There are a multitude of manufacturers that make suspension kits for TTB vehicles. Finding one with good sturdy brackets can be a bit daunting though. Many of the available brackets can be easily bent with a hard lateral impact to the wheel. No damage to the axle itself is likely in such an incident, but with the bracket bent, the wheel alignment is lost. This is a source of many headaches when it comes to keeping these things aligned. A kit with good sturdy brackets will maintain the alignment much better. 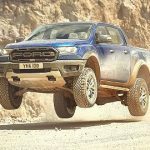 On the mid-size Fords, for example, kits that completely REPLACE BOTH pivot brackets are more likely to be sturdy. Some kits use a “drop-plate” extension that the stock pivot bracket attaches to. These can get tweaked and not stay in place. The drop-plate also creates a clearance issue with the Dana35 differential. When setup for large amounts of travel, the diff housing can strike the pivot bracket when mounted on a drop-plate, likely damaging the diff housing. Skyjacker is one company that has good brackets on their Class II series of kits and I highly recommend them. Following are some tips on getting the best performance out of the suspension. For the D35 TTB axle, the pivot bolt should be 1″ higher than the center of the wheel hubs. The D44 TTB axle should have the pivots at the same height as the hubs. When a lift is installed (or even on many factory delivered vehicles) the suspension will often be below this ideal height. This puts the top of the tires inward, requiring a positive camber correction to align it. While it is possible to align it to within factory specification with the suspension as much as 1.5″ above or below this ideal height, performance & ease of alignment will be improved with it at level. Being below level also reduces ground clearance under the axle, not to mention reduces up-travel. A high amount of angle on the center U-joint can make for a bit of a “lurching” motion while in 4×4. Adjusting this height is accomplished through the use of shims under the lower coil spring seat on top of the axle beam, where the radius arm attaches. Large washers can be used to provide increments of about 1/4″ per washer. If a large amount of correction is needed, a 1″ thick spacer can be put in. This will give roughly 1.5″ of lift height. You can go as high as needed as long as there is sufficient thread length to reattach the coil retainer. After that, a longer spring should be used. These shims can also be used to regain lost height after installation of a winch & bumper, and the dual batteries needed to run the winch, or other heavy front-end accessories. Pictured is a coil spacer used to raise the ride height. This is an example of a D35 suspension setup at optimum height. The axle pivot (arrow) is slightly above the wheel hub centerline. In this picture, you can see the axle pivot is much lower. This is most likely to occur on the heavier models such as on Supercabs and 4dr Explorers. As you can see, it is not ideal for clearance under the axle. In this particular example, the available upper bracket hole should have been selected. 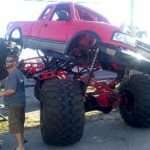 When checking the ride height, it is imperative that you roll the truck back and forth 10-20 feet on a level surface to settle the suspension before checking the height. When let down off the jack or hoist, the tires will be cocked under some, which will give an erroneous height reading (bouncing the suspension will NOT fully settle it). The steering on TTB suspensions is a sore spot that seems to have been somewhat overlooked by the aftermarket lift industry. Most companies do provide a dropped pitman arm to help correct some of the steering linkage angle after a lift, but if the amount of drop the pitman arm provides does not closely match the lift height of the pivot brackets (to within 1.5″ or so), the steering can become quite ill-behaved, and is probably the most common cause of the tire wear complaints that often surround this suspension. The stock “inverted-Y” style tierod linkage is rather unforgiving of a bad angle as well, and only compounds the problem. Most aftermarket drop arms are about 2-3″ dropped compared to the stock arm. 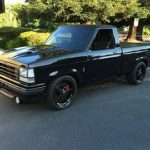 For this reason, dropped pitman arms used alone should best be avoided if possible on suspension lifts greater than 4″ in favor of a centerlink type steering linkage (such as the Superrunner steering conversion offered by Superlift Suspension (you could call this a “K” style linkage). This type of linkage is better capable of following the movement of the two halves of the suspension without inflicting near as much bumpsteer (toe in/out variation) at the wheels. 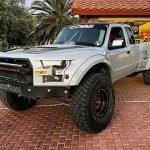 The improvements this kit provides are quite noticeable even in the 3-4″ lift range as well (and is actually ideally suited to those lift heights. Superlift states it can be used with up to 6″ lift however). The Superrunner kit can be used with a non-Superlift brand suspension kit. This picture shows the Superlift steering linkage conversion installed with a Skyjacker Class II suspension lift. If you’re handy with a welder, you may be able to build such a linkage yourself for a considerable cost savings, and at the same time (if needed) optimize it for a 6″ lift height by setting the centerlink about 2″ lower than what Superlift designed it at. However, I do NOT recommend that you attempt building (or modifying) a critical component such as the steering unless you have full confidence in your welding and fabricating ability, and are good at sourcing parts for it. The TTB suspension is best not lifted over 6″, though. After this height, it becomes near-impossible to restore good steering geometry. A bodylift can be used for additional height, if desired. As with any suspension, having the right shock length and spring rate is key to getting the most flex when off road. It is usually possible to improve significantly in this area over what’s offered by the lift industry. Many springs are quite stiff, which limits up-travel, and the shocks provided in a kit are often shorter than what’s ideal, limiting down-travel. This can cost several inches overall travel in many cases. 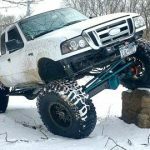 To find the right shock length, the vehicle can be jacked up letting the suspension completely relax (hang) and then measuring the distance between the shock mounts. This is to be done with the spring in place, but without the shock (A spring clamp or J-clip on the Ranger/Explorer/BII upper spring mount will be needed to retain the spring in the tower and should actually be used at all times). Measure from the base of the top stud to the center of the lower eye. This will give the extended length of the required shock. If between available lengths, go with what’s closest. A little longer/shorter shouldn’t matter much. With the shock in place, set the bump stop to just touch with about 1″ shock travel left. Shims/washers or a metal spacer & a longer bolt can be used on the bump stop to set its height. Be sure to check that the differential housing won’t contact the passenger side beam pivot bracket if it’s the “drop-plate” type. Also check to see that the radius arm bushing isn’t overstressed from too much angle if the vehicle still has stock length radius arms. If needed, the bump stop can be set an inch or so lower to preserve bushing life. Removal of the coilspring (shock still in place) can make the process of setting the bumpstop height much easier. The lower the spring-rate of a spring, the more it will flex. This is something to research when shopping for a suspension kit. Again, Skyjacker seems to have a bit lower rate springs than most. They often need the shimming for height mentioned above, but is not detrimental to performance in any way. The use of rod ends (Heim joints) on the extended radius arms can also bring forth some additional travel and flex, although they will be of little benefit unless custom extended shock/spring towers are also used. Let’s not forget about the anti-swaybar, as well. Disconnect-type end links can be purchased (or made) to allow quick removal of the swaybar for better trail performance. Some degradation of street handling will, of course, occur with it disconnected, so its best to disconnect it only for off road. 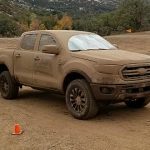 Hopefully a time will come that we start seeing some new or redesigned stuff in the suspension aftermarket for the TTB Fords. Coils more specific to bodystyle & engine types, flexier coils, and improvements to the steering. Until then, the tips above should be of some help in attaining a greater level of performance out of your lifted Twin-Traction-Beam truck.